Some call it ‘influence’, some the ‘X’ factor. Certainly the ‘Voice’ and ‘American Idol’ know what it is. Meridith Elliott Powell, one of our Fun Fearless Female speakers in Asheville calls it the ‘WOW’ factor. (I Really like that one – Meridith I think I have to borrow that for our WOW the World Conference!) It is a big part of what we talk about at our Women’s Conference. Discovering your ‘WOW’, your ‘Clout’, and allowing yourself to make a difference. It is that ‘thing’, that ‘something special’ that you have. It may be so natural to you that you don’t even see it as something special, but it is your God-given gift. Clout is your God-given power and influence. You were made by God uniquely. Your clout needs to be both discovered and unleashed in your life! 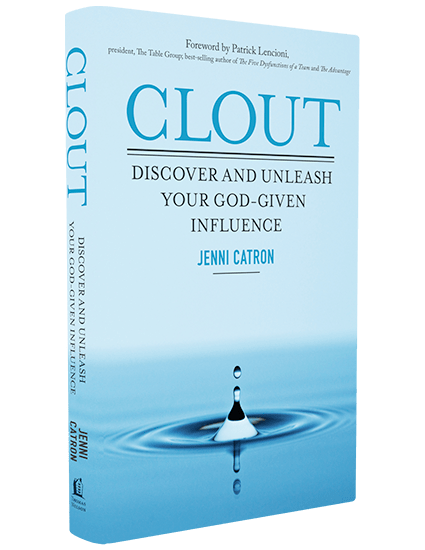 I’m excited today to share with you a book that Jenni Catron has written called Clout. YES, we all have Clout. You have clout – in you family, your home, your church, workplace, and maybe even more areas. You have a choice in how you use it . . . to bless . . . or not. QUESTION: In what areas do you have Clout?